Amazon is selling a trio of docking stations for all-time lows. We all know the pain of not having enough ports on our PC and the pleasure that a good docking station can bring, helping to connect all the peripherals while eliminating the need for dongles. Today, Amazon is selling several Sabrent docking stations for their lowest price everRemove non-product link, from a 5-port mini dock all the way up to a 10-port powerhouse. The DS-CMND 5-port USB Type-C docking stationRemove non-product link is the cheapest of the bunch, discounted to $50 from a list price of $90. This mini dock is especially good for connecting USB devices to your phone, with two USB 2.0 Type-A ports, a USB 3.0 Type-A port, an HDMI DisplayPort, and an Ethernet adapter, you'll be able to hook up your device to a lot of connections. It also weighs just over a pound, so it's light enough to take along wherever you go. The 10-port USB Type-C Triple 4K display docking station is $148Remove non-product link, down from a list price of $249. Through your computer's Type-C port, you'll be able to connect with speeds up to 5 Gbps. This dock features four USB 3.0 Type-A ports, one USB 3.0 Type-A port, and an HDMI port for 4K video. And finally, the Sabrent Thunderbolt 3 Docking Station is $170Remove non-product link, down from a list price of $269. This dock has fast transfer speeds up to 5Gbps and 4K resolutions, as well as a built-in indicator light to show when it's powered up. 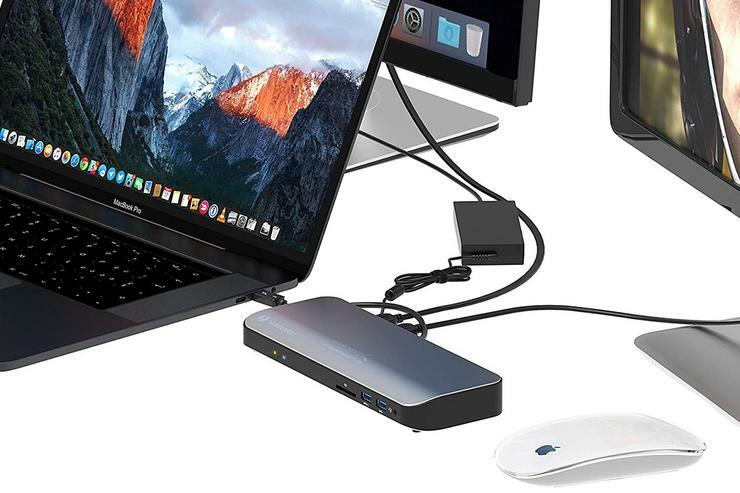 The dock features a Type-C Thunderbolt 3 data transfer port, four USB 3.0 Type-A ports, an HDMI 2.0. port, an Ethernet adapter, a USB 3.0 Type-A port, and an audio jack for full connectivity. Although we haven't tried these docks ourselves, we're big fans of Sabrent's accessories, so if you're looking to build out your PC or Mac's peripheral connections, these devices can help do it for less.